In the 19th Century Nahant was a popular and elegant Summer resort destination for those who wanted to escape the heat of the city. Sadly, the Nahant Hotel burned in 1860; none of Nahant’s grand hotels remain today. During the Nahant Ball weekend we are trying to recapture the elegance of Nahant’s heyday. There are few watering-places in the United States more widely known than Nahant. Few strangers come to our metropolis, in the Summer season, without paying it a visit. It is almost like going to sea to visit the extremity of the peninsula, which pushes its bold front far out into the ocean, and breasts the Atlantic surges which dash continuously against its iron base. The brief voyage thither in the steamboat is one of the most delightful trips that can be taken. It gives new life to the feeble frame, to be wafted on the deck of the Nelly Baker, Captain Rowell, from the warm atmosphere of the inner bay to the gloriously cool surface of the open sea, and to see before you the long rocky peninsula dotted with pleasant summer residences, stretching far out from the mainland. But many give the preference to the land route; the drive across the beaches, with a fine level floor of sand for the horses' feet, and the rollers curving in incessantly on the seaward side, rendering it a most delightful excursion. Nahant is by no means an arid waste of rock and sand however. The variety of scenery comprised within its limits is a feature in which it has the advantage of most seaside resorts. Right in the centre of Nahant proper, where the surface sinks into a deep hollow, there is a green oasis of waving trees, and gardens, and flowers, and fruits, which is quite as rural as many a rustic dale a thousand miles away from the seaboard. Hence Nahant has for more than forty years been a favorite resort, and representatives from almost every state in the Union have been found here in the summer season. Hitherto the hotel has always been well patronized, but although well kept by Mr. Drew, it was not extensive enough for the accommodation of the public. Col. Stevens, of the Revere, so soon as he came into possession of it, enlarged and fitted it up throughout in the most sumptuous manner. It now possesses every requirement of comfort and luxury. It is provided with a costly apparatus for warming the apartments, so that now the guests are no longer are no longer obliged to take wing for the city so soon as there is an easterly spell of weather. Thus the season at Nahant begins early and ends late. The house is thronged with company, the table is liberally catered for, and within doors everything is as agreeable as the scenery is attractive without. Our representation gives a fine view of this pleasant hotel. During the late 19th Century Nahant was the resort community of Boston’s high society; each summer the elite of Boston would spend their vacations enjoying Nahant’s cool summer breezes. 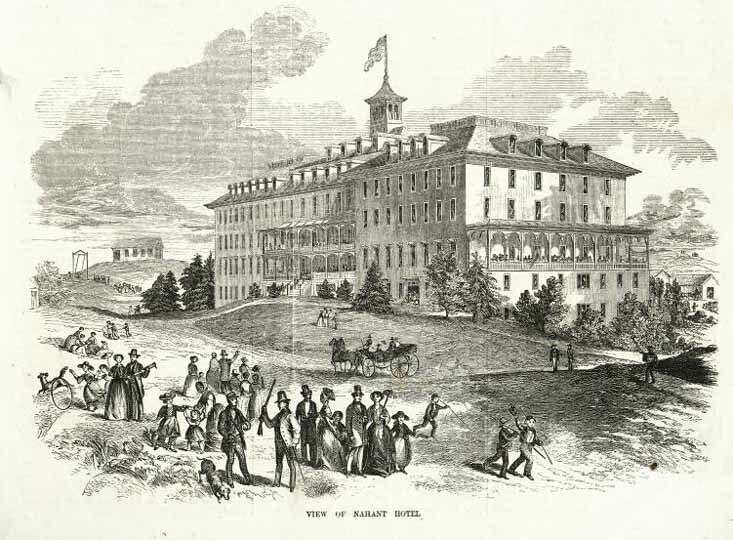 Many stayed in their own, private, summer cottages while others enjoyed a stay at the Nahant Hotel; in either case, summer evenings were usually spent at elegant evening dances and Balls providing a venue for all to enjoy music and the company of others. Each summer for the past nine years, we have been holding the Nahant Victorian Day Ball as an attempt to recapture those wonderful events from Nahant’s heyday as a resort community. We see the evening as an opportunity to dress up and dance the way they would have in the 1890s; an opportunity to have fun and see for ourselves a small portion of what life was like in the days before radio, TV or even recorded music was common. This year the Ball will be held on Saturday July 7th, from 7:30 to 11pm at the Town Hall. The music for the evening will be provided by Spare Parts, an ensemble experienced in both dance and “vintage” music appropriate for the evening. They will feature several local tunes, written in the 19th Century, such as the Nahant Waltz and the Nahant March. And once again our caterers’ will provide a sumptuous assortment of refreshments for everyone. But a dance is more than the hall, the music, or the refreshments; the people who attend the Ball are its very soul. This year we hope to attract the "dance-shy" by holding an afternoon workshop, on the day of the ball, that will cover many of the actual dances for that evening including The Nahant Quadrilles a figured dance that was written in Nahant during the 19th century. Give it a try and be ahead of the so- called “experienced” dancers at the Ball itself. If you are not even willing to give that a try, we invite you to be a spectator. The Town Hall has a wonderful balcony from which to view the Ball; the beautiful gowns worn by the ladies are as much a joy to watch as they are to dance with. For further information, please contact Katy or Ben Bishop at 781-499-2589 or e-mail we look forward to seeing you at the ball!